This chapter presents the findings of the analyses described in the previous chapter. First, we look at changes in the population, number of dwellings, extent of urban land, composition of the dwelling stock, and gross urban density for each region between 1991 and 2001. In some cases, the findings are broken out into submetropolitan zones that generally correspond to dominant eras of development: pre-1951, 1951-70, and 1971-2001. We then compare development patterns in greenfield areas and in already urbanized areas using maps and spatial analysis. A comparison of growth in the population, number of dwellings, and urban land area shows that the Toronto, Vancouver, and Calgary regions all grew rapidly between 1991 and 2001 (see Table 3.1). a values are rounded to the nearest 100.
b the urban land area values are based on 1990 satellite imagery. Toronto grew the most in absolute terms, adding 889,674 new residents and 359,593 new dwelling units. Vancouver and Calgary had lower levels of absolute growth than Toronto, but their rate of growth was higher. In Vancouver, housing stock increased by similar proportions (24%), while in both Toronto and Calgary, the housing stock increased at a slightly higher rate than population. This means that the average household size declined in Toronto and Calgary. As a result, in those two cities, a significant proportion of new dwellings accommodated a redistribution of the existing population, rather than incoming migrants or new residents added through natural increase (births minus deaths). In Calgary, the urban land area grew at a rate considerably higher than that of the population (43% versus 24%). To a lesser extent, the same pattern occurred in Toronto (28% versus 19%). In Vancouver, by contrast, the urban area grew at a rate two-thirds that of the population growth rate (16% versus 24%). As mentioned in Chapter 2, one classic definition of "sprawl" is that the rate of urban area expansion is greater than the rate of population growth. By this definition, Calgary and Toronto sprawled during the study period, but Vancouver did not. the Newer Suburbs contain areas built out since 1971. In each case, the largest increase in population, dwelling units, and urban area is in the Newer Suburbs. This is not surprising, as older areas are mostly built out in all three regions. In Calgary, almost all growth occurred in the Newer Suburbs, whereas in Toronto and Vancouver, significant population growth and housing construction occurred in Core Areas and Older Suburbs, some of it in the form of intensification and some of it in the form of greenfield development. In Calgary, the population of the Older Suburbs stayed the same, while in the other cities it grew. This suggests that what small amount of infill and redevelopment occurred in these areas was not enough to offset decline in average household size elsewhere in the zone. Note: The sums of values for the three submetropolitan zones do not equal the region-wide totals in Table 3.1. This is due to differences in the source data used to construct the tables. See Chapter 2 and Appendix A for explanation. In the Vancouver metropolitan region, the overall pattern is clear: single detached dwellings decreased as a proportion of housing stock, while the proportion of medium-density and higher-density housing forms increased. In Calgary, where in 1991 single detached dwellings comprised a larger proportion of the housing stock than in Vancouver or Toronto, the reverse is true. Single detached dwellings increased as a proportion of the total housing stock, even as higher-density forms decreased. In Toronto, single detached dwellings held steady as a proportion of housing stock. The proportion of medium-density housing increased, and the proportion of apartments declined slightly. Table 3.4 summarizes the distribution of housing growth across two of the three submetropolitan zones for each region. Table 3.5 shows the absolute change in the number of dwellings in each zone. In both tables, numbers are shown for each type of dwelling. The data show that growth was distributed quite differently across the three submetropolitan zones. In Calgary, 88% of new dwellings were constructed in the New Suburbs, compared to 66% in Toronto and 59% in Vancouver. Unlike Toronto and Vancouver, little development occurred in Calgary's older areas. See Table C.1 in Appendix C for the complete table on which Table 3.4 is based. The type of housing built in each zone also differed between regions. In Vancouver's Core Areas, the number of single detached dwellings actually decreased over the study period by 2.4%, from 73,435 to 71,650. A small decline also occurred in Calgary's Core Area. In both cases, this indicates substantial redevelopment activity, with lower-density housing forms being demolished and replaced by higher-density ones, such as apartments. In Toronto, the absolute number of dwellings increased for all dwelling types in all zones. In Toronto's Core Areas and Older Suburbs, most growth was in the form of apartments, while in the Newer Suburbs, single detached houses constituted the majority of construction. Apartments made up a greater share of Vancouver's housing growth than in the other regions. Over all, apartments make up approximately half of all growth in Vancouver (50%) -- almost double Toronto's share (25%), and four times Calgary's (12%). The reverse is true for single detached houses. In Calgary, 74% of housing growth during the study period was in the form of single detached houses, compared to 50% in Toronto and 16% in Vancouver. About 84% of all development in Calgary's Newer Suburbs was in the form of single detached houses -- a stark contrast to Toronto's (61%) and Vancouver's (29%) shares. The quantity and distribution of medium-density housing -- semi-detached, rowhouses, and duplexes -- follows a similar trend. Vancouver has the highest proportion of medium-density housing construction overall and in the Newer Suburbs, Toronto less so, and Calgary the least. Note: Movable dwellings are not shown, but are included in "all dwellings" amounts. The impact of the changes between 1991 and 2001 in the composition of the housing stock in each submetropolitan zone is summarized in Table 3.6.3 The proportion of the total stock accounted for by single detached houses decreased in the Core Areas and Older Suburbs of all three regions, while the proportion of apartments increased. In Vancouver and Calgary, the proportion of medium-density dwellings increased, while in Toronto it declined somewhat. This is evidence of redevelopment in favour of higher-density housing forms in the Core Areas and Older Suburbs of all three regions. In Toronto's and Vancouver's Newer Suburbs, the proportion of medium-density housing was higher in 2001 than it was in 1991. In Calgary, the opposite is the case. The proportion of single detached houses in the Newer Suburbs increased, while medium-density house forms and apartments declined. While Toronto and Vancouver moved toward a denser mix of housing types over the decade, Calgary moved away. The fact that Vancouver ended the decade with a denser housing stock than it had at the beginning, in contrast to the opposite trend in Toronto and Calgary, is consistent with the earlier finding that Vancouver's percentage increase of population and housing is higher than its percentage increase of urbanized land. Given the different rates of population and housing growth on the one hand and urban area expansion on the other, as well as changes in the composition of the housing stock, one would also expect the gross urban density of each metropolitan region to change. Of the three, only Vancouver's gross urban population and housing density increased between 1991 and 2001, while Toronto's and Calgary's declined (see Table 3.7). Note that gross urban area includes non-residential areas such as employment lands, expressways, railways, and electrical transmission corridors. These land uses are not distributed evenly across the landscape and vary according to each metropolitan region's economic base and geography. Thus the density numbers shown should be considered approximate. The direction of change over the study period, however, is a valid finding. Table 3.8 breaks out housing and population density by submetropolitan zone. Vancouver's housing density increased in all three zones, while Calgary's decreased. Toronto lies in the middle, registering modest increases in the Core Area and the Older Suburbs, and a very small increase in the Newer Suburbs. This suggests that redevelopment in the older parts of Vancouver and Toronto increased overall density. In Calgary, however, development activity in established areas did not lead to a net increase in housing density. In Vancouver, population density increased in all zones by amounts similar to the change in housing density. This indicates that the average size of households in each of Vancouver's three zones remained more or less constant. In Toronto, the change in population density was small -- less than 2% in either direction -- despite net increases in the number of dwellings in each zone. In Calgary, population density declined in all zones between 1991 and 2001. In zones where population density declined by more than housing density, average household size decreased. For a variety of social and economic reasons, average household size in industrialized countries has been in decline for several decades. The prospect of fewer residents occupying the same physical space as time goes on -- as we see in Calgary's Older Suburbs -- may have negative implications for the efficient provision of public services and infrastructure. The stark difference in population density between Calgary's Older Suburban and Newer Suburban zones is an unexpected finding. Given the much smaller gap in housing density between the two zones, it may be that the Newer Suburbs attracted larger households during the study period. Most greenfield development took place in just five of Vancouver's 21 municipalities. (See Table 3.10.) Surrey (27.2%), Langley Township (18.4%), Coquitlam (11.2%), Maple Ridge (10.5%), and Richmond (9.4%) together accounted for three-quarters of construction on newly urbanized land. Compared to the other regions, the volume of greenfield development was small -- 34,320 units in Vancouver versus 166,754 in Toronto and 56,717 in Calgary. Note: The sums of municipal values do not equal the region-wide totals in Table 3.1 due to differences in the source data used to construct the tables. See Chapter 2 and Appendix A for an explanation. As discussed in Chapter 2, we used landscape pattern metrics to describe the spatial pattern of development on land urbanized between 1990 and 2001. During the study period, the majority of new development in each region occurred within four kilometres of the 1990 urban land base. We refer to this area as the urban fringe. In the analysis, we divided up the urban fringe into a series of concentric bands and calculated (1) urban land density, (2) average urban patch size, and (3) the percentage of urban patches found in each band. Changes in each metric across the bands indicate differences in the amount and pattern of new development across the urban fringe. To calculate urban land density -- the ratio of developed land to developable land -- the urban fringe was divided into 16 bands. In Figure 3.2, urban land density is plotted for each band to create a density curve for each region. 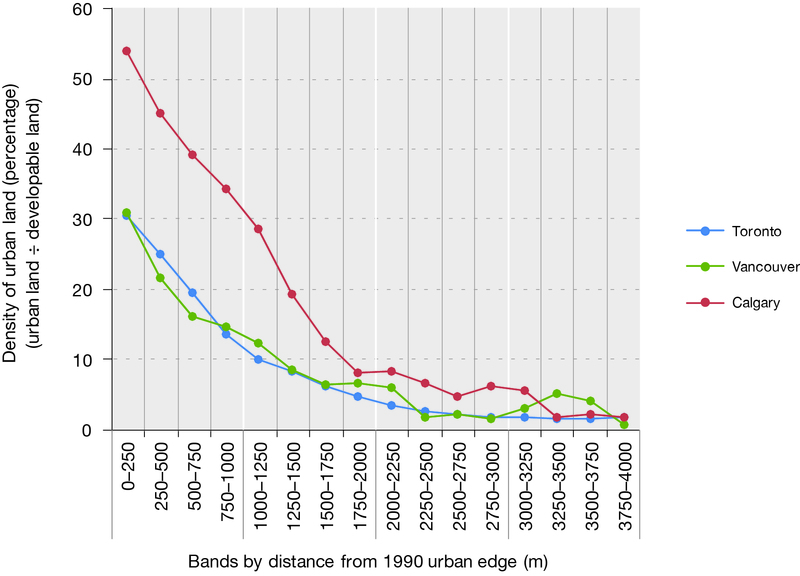 The horizontal axis shows how far away each band is from the edge of the 1990 urban land base, and the vertical axis shows the ratio of urban land to developable land, calculated as a percentage. As we move outward from one band to the next, it is expected that urban land density will decrease. Higher urban land density values in bands closer to the 1990 urbanized boundary indicate that greenfield development is contiguous to the already urbanized area. A U-shaped curve would suggest that development is "leapfrogging" over as-yet undeveloped land. In all three regions, urban land density is highest near the 1990 urban land base, and the curves follow a negative slope pattern -- meaning urban land density decreases -- across the initial two kilometres of the urban fringe before levelling off. This suggests that greenfield development between 1991 and 2001 was relatively contiguous. The urban land density curves for Toronto and Vancouver are similar, even though Toronto has fewer constraints on development than Vancouver. However, the results would be different if we had included in the urban-fringe analysis land that was not available for development due to policy constraints. More land is protected from urban development near the existing urban area in Vancouver than in Toronto. If we had included Vancouver's Green Zone and Agricultural Land Reserve as developable land, urban land density for the Vancouver would have been much lower across the urban fringe, reflecting Vancouver's low rate of greenfield development. A comparison of the curves for the three metropolitan regions shows that Calgary's urban land density is almost double that of Toronto and Vancouver for the initial two kilometres of the urban fringe. The apparent conclusion from this is that although all three regions have development that is relatively contiguous to existing urban area, the pattern in Calgary shows greater contiguity than the others. There are several possible reasons for this finding. First, compared to the other regions, which are larger and feature multiple discrete urbanized areas, Calgary has one, smaller urban land base. A similar amount of urban development would therefore take up more of Calgary's urban fringe than Vancouver's or Toronto's, leading to higher urban land densities in Calgary. Second, as discussed in the next section, the fact that the vast majority of Calgary's urban development is on greenfield land rather than in the form of intensification may lead to more efficient development of the urban fringe. Finally, it may be that Calgary, being governed by a single planning authority, is better able to efficiently implement a policy of contiguous urban development. For the next round of analysis, we aggregated the sixteen 250-metre bands into four 1-km "superbands" and measured the number of discrete urban areas, or urban patches, in each. In order to account for differences in size among the three regions, we expressed this measure as the percentage of urban patches in each band to all urban patches in the urban fringe. In addition, we also measured the average size of urban patches (in hectares) within each of the 1-km-wide superbands. Together these metrics indicate the relative fragmentation of development. In Figure 3.3, observations for both metrics are shown. The horizontal axis shows the distance of the four superbands from the edge of the 1990 urban land base. The vertical axis indicates the percentage of urban patches found in each superband. Average patch size is indicated by the size of the circle above each bar. The distribution of urban patches across the urban fringe, as indicated by percentage of urban patches in each 1-km-wide superband, is similar in each of the regions. The largest number of urban patches is found within two kilometres of the 1990 urban boundary -- approximately 80% in Calgary, 85% in Toronto, and 95% in Vancouver. Very few patches are found in the outer two superbands of the urban fringe. This suggests that greenfield development in the 1991-2001 period was highly contiguous, with minimal leapfrogging. 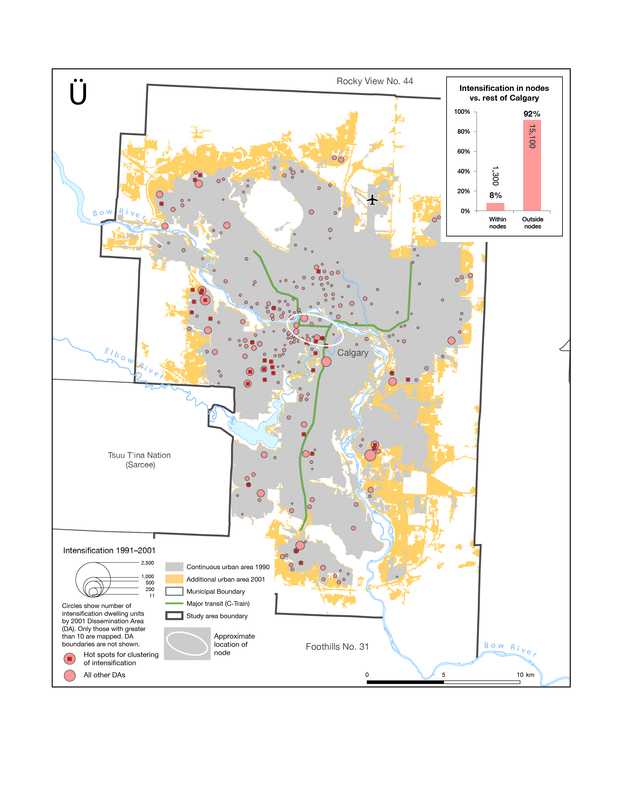 With the exception of the fourth superband, urban patches are largest in Calgary. Given the contiguous nature of development in Calgary, larger urban patches may correspond to a more rapid pace of development. In Vancouver, which had the smallest proportion of overall development occurring on greenfield land, it is not surprising that urban patches are on average smaller than in the other two regions. 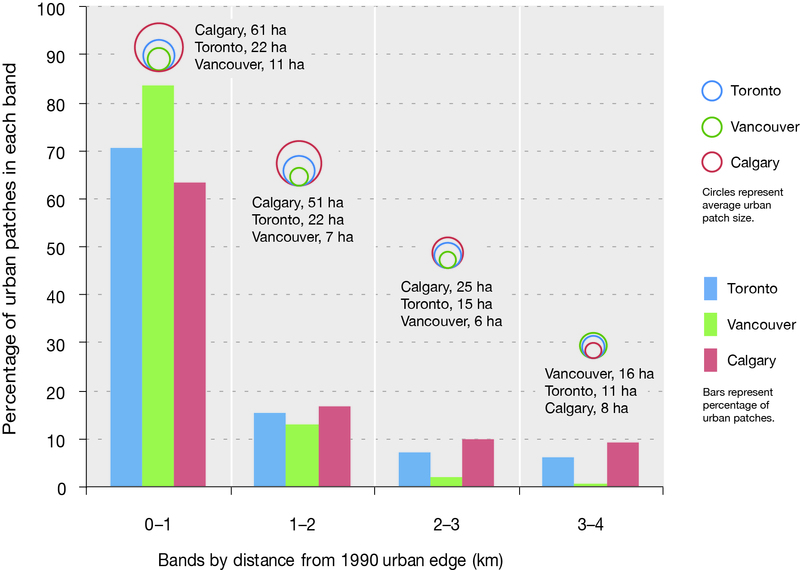 In all four superbands, the size of Toronto's urban patches is somewhere between Calgary and Vancouver. The intensification analysis builds on the earlier discussion of overall housing growth broken out by municipality. The largest proportion of intensification in the Toronto and Vancouver regions occurred in older core municipalities, such as the City of Toronto and the City of Vancouver, that were largely built out by 1991. (Calgary, as a single municipality, can be analysed only by submetropolitan zone -- see the discussion and Table 3.14 below). The City of Toronto accounted for about half of all intensification units produced in the Toronto region, while the neighbouring municipalities of Peel and York accommodated most of the rest (see Table 3.12). In the Vancouver region, the mostly built-out Burrard Peninsula -- the Cities of Vancouver, Burnaby, and New Westminster -- accounted for 46% of all intensification units (see Table 3.13). Port Coquitlam could potentially have expanded outwards onto rural land not protected by the Agricultural Land Reserve or the Green Zone, yet it has accommodated the majority of its growth through intensification. Surrey is an especially interesting case, as it appears to have grown both out and up. Although Surrey accounted for the highest number of greenfield development units (over 9,000), it also accounted for more than 20% of the region's intensification dwelling units, second only to the City of Vancouver, at 32%. Note: These numbers are broken out by lower-tier municipality in Table C.3 in Appendix C.
Turning to the distribution of intensification by submetropolitan zones, it is perhaps surprising that in all three regions, the largest proportion of intensification occurred in the Newer Suburbs -- 49% in Vancouver, 46% in Calgary, and 45% in Toronto. There are several reasons why this may be the case. First, given the way in which the zones were defined, the Newer Suburbs account for a very large territory. In all three regions, the Newer Suburban zone, which represents areas that have been largely built out since 1971, contains the largest urbanized land area. While intensification may be thinly dispersed across this large territory (a finding that will be discussed below), it adds up to a significant amount. Second, there is apparent infill near the edge of the urbanized area, a phenomenon discussed in more detail in Burchfield (2010). New urban areas may contain gaps due to the nature of the urban development process. This is not "leapfrog" development as it is conventionally understood. Over the long term, the contiguity of the urbanized area is maintained, however in the short term, urban development is built out of sequence, leaving holes that will be filled in later when market conditions permit.5 A proportion of the intensification measured in this analysis is likely to represent out-of-sequence greenfield development, although there is no way to distinguish between the two using available data. This explanation fits with the analysis in the previous section, which showed that the urban fringe is "patchy," but that the transition from urban to non-urban is largely complete within 2 km of the edge of the urbanized area in all three regions. This issue aside, it may be significant that, relative to the Older Suburbs, Core Areas accounted for a greater share of intensification in Vancouver, while the relationship was reversed in Toronto. Chapters 4 and 5 will explore the degree to which policies or other factors may have directed growth to one zone over the other. 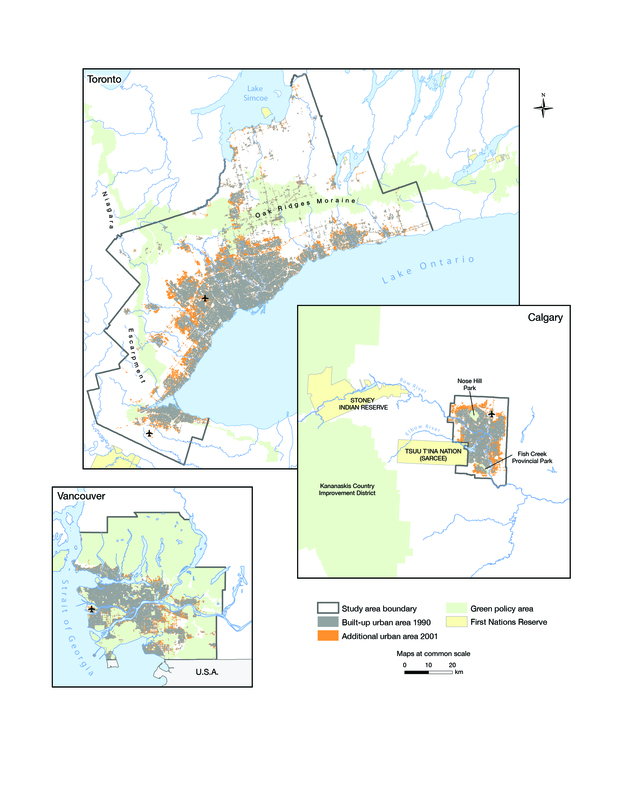 In Calgary, the Core Areas and Older Suburbs contained similar proportions of intensification, however the small absolute amount of intensification overall compared to Toronto and Vancouver -- less than 17,000 dwellings in Calgary versus about 130,000 in the other two regions -- makes this finding less consequential. Reporting the location of intensification by municipality and by submetropolitan zones defined by their dominant era of development is useful, but greater precision can be achieved by mapping the location of intensification at a finer grain, and by using spatial statistics that indicate the degree to which intensification is clustered. The maps also show the 1990 and 2001 urban areas. As discussed in the previous section, pink circles at the edge of the 1990 urban area indicate infilling of small "holes" at the edge of the urbanized area. (These holes are areas that were not originally developed at the same time as surrounding areas for various reasons, and were temporarily left as vacant land.) Figures 3.4, 3.5, and 3.6 show the 1990 urban area as a solid shape to make the intensification pattern more clearly discernible, but these small holes are visible in the maps in Appendix B. Designated downtowns and node planning areas designated or zoned for intensification are shown as white ovals. The precise boundaries of these planning areas are shown in Appendix B. Major transit infrastructure is also included on the maps. Juxtaposing these areas of investment against the patterns of intensification provides a more informed interpretation of the presence or absence of policies that support intensification. The maps also incorporate the results of a local clustering analysis -- the LISA statistic. The LISA statistic is used to identify "hot spots" of spatial clustering in each region. These are shown as red squares. They represent locations where both a high degree of intensification and a high degree of spatial clustering are found. In other words, red squares correspond to locations where DAs with a large number of intensification units are adjacent to other DAs with a large number of intensification units. In the Toronto metropolitan region, intensification appears to occur in geographically concentrated areas. The largest concentration is found along the Yonge Street corridor, running from the City of Toronto's downtown to southeast Vaughan and Richmond Hill to the north. Other concentrations are visible along the waterfront, in the middle suburbs of the City of Toronto, and around the Mississauga City Centre node. Smaller amounts of intensification activity, perhaps representing single-building infill or redevelopment projects, or the creation of basement apartments in existing dwellings, are found throughout the urban area. Within the City of Toronto, the locations of the LISA-derived "hot spots" largely coincide with the downtown area and designated nodes. Outside the City, there is significant clustering in parts of Vaughan, Markham, Richmond Hill, Mississauga, and Brampton. A different pattern is visible in the Vancouver metropolitan region. Intensification is visibly concentrated in Vancouver's metropolitan core and in the eight designated town centres. The metropolitan core area includes high-profile areas of residential intensification: Coal Harbour and Yaletown. Outside these areas, small amounts of intensification appear to be scattered throughout the built-up urban area. The Expo SkyTrain line appears to have attracted development in the Cities of Vancouver, Burnaby, New Westminster, and Surrey. This finding is corroborated by an analysis by the GVRD (2002:4), which found that population growth near the route of the Expo line was higher than for the region as a whole. "Hot spots" occur largely where expected: in designated downtowns and node planning areas and along the Expo SkyTrain line. Additional hot spots are observed in the portions of Surrey adjacent to North Delta and White Rock, and the Walnut Grove area of Langley Township. The relative absence of intensification in North Delta compared with the cluster in the adjacent part of Surrey may indicate differences in municipal policies. Calgary's comparatively small amount of intensification is sparsely distributed across the urbanized area. Small amounts of intensification are scattered throughout the Older Suburbs, though some appear closer to the edge of the urbanized area. As discussed earlier, near-edge intensification in all three regions, but especially visible in Calgary and Toronto, may represent the filling in of holes in the urban fabric during the development process. The hot spots located to the west of downtown correspond to the location of Garrison Woods, a neo-traditional residential neighbourhood developed on the site of a decommissioned military base (CMHC, n.d.), as well as areas bordering Mount Royal College. Finally, we also employed a spatial statistic called Moran's I to determine whether the intensification data analysed for each region exhibits clustering. As described in Chapter 2, this statistic is global rather than local; it provides a summary indicator of clustering for each region as a whole as opposed to its parts. Although a strong clustering pattern of intensification was not found in any of the regions, the results are consistent with the general trends. Vancouver's pattern is furthest from random (i.e., more clustered) with a Moran's I value of 0.264. Calgary displays greater randomness (i.e., an absence of a spatial pattern) with a score of 0.090. Toronto's score lies in between, at 0.193. As will be discussed in detail in Chapter 4, planning authorities in the three regions have designated specific zones for intensification. Figures 3.4, 3.5 and 3.6 show the proportion of intensification that occurred in some of these planning areas. Measuring development activity in these areas is simplest for Vancouver, which has a longstanding "town centres" policy in its regional plan. In the Toronto metropolitan region, the picture is more complex, as over the years, many "centres" and "nodes" have been designated in local plans, and the boundaries of these centres and nodes have often been vaguely defined (see Chapter 4). A few "mature" nodes -- those that are now largely built-out and generally considered successful -- are identified here.7 As Calgary has not pursued a strategy of directing growth to specific planning districts, only the downtown planning area is considered. Table 3.15 summarizes development activity in the designated planning areas. It shows that the downtown core areas of Toronto and Vancouver attracted the largest proportion of intensification in the designated planning areas: 42% and 43%, respectively. By contrast, Calgary's downtown area attracted only 8.2% of all intensification units, and only 1.8% of total dwelling unit growth during the study period. Downtown core areas aside, designated nodes have played a modest role in accommodating total growth. Toronto's downtown and the five nodes shown attracted 13.6% of all intensification and 6.0% of total dwelling unit growth over the study period.8 Vancouver's metropolitan core and eight designated town centres did somewhat better, attracting 24.2% of intensification and 19.3% of total growth. While in percentage terms each metropolitan region experienced substantial population and housing growth over the study period, this growth took different forms in each place. (See Table 3.16 for a summary of findings.) Vancouver accommodated 80% of its residential growth through intensification, while almost the opposite occurred in Calgary, where 78% of the housing growth occurred as greenfield development in the urban fringe. Toronto's rate of intensification (44%) was in between Calgary's and Vancouver's values. In absolute terms, Toronto added about double the number of people and dwellings as Vancouver, which in turn added double the amount in Calgary. This is not surprising, given their positions in the Canadian urban hierarchy, both in terms of size and as reception areas for immigration. (Toronto is Canada's largest city-region and largest magnet for immigration; Vancouver is the third-largest city and second-largest magnet for immigration; Calgary occupies a lower position on both counts.) Nevertheless, over the decade, Calgary converted much more non-urban land to urban use than Vancouver to accommodate half as many additional residents. For every 100 new residents, Calgary added 6.3 hectares, Toronto 4.4, and Vancouver 2.3. The type of housing built is a key driver of land consumption. Almost three-quarters of residential construction in Calgary between 1991 and 2001 was in the form of single detached houses, compared to 50% in Toronto and 16% in Vancouver. By contrast, 50% of construction in Vancouver was in the form of apartments, compared to 25% in Toronto and 12% in Calgary. These growth patterns have led to changes in the composition of the total housing stock in each metropolitan region. Large amounts of intensification increased the proportion of apartments, semi-detached houses, rowhouses, and duplex dwellings in Vancouver, while the share of single detached dwellings declined. The reverse trend occurred in Calgary, where single detached dwellings increased as a proportion of total housing stock at the expense of higher-density housing forms. In Toronto, the proportion of single detached dwellings stayed about the same, that of apartments decreased, and that of medium-density forms increased. As a result of these different patterns of development, Vancouver's gross urban density increased, and Calgary's and Toronto's decreased. These trends have long-term implications, as increasing -- or at least maintaining -- the density of the existing urban area is considered a prerequisite for the efficient provision of public transit and other infrastructure. One might assume that lower-density urban areas contain more opportunities for infill and redevelopment, and therefore greater intensification activity. Toronto started and ended the study period with higher housing densities in its Core Areas and Older Suburbs than those in the corresponding areas of Vancouver and Calgary. If the assumption is correct, we would expect that intensification is more difficult to achieve and that the intensification rate would be lower in Toronto than in the other regions. However, the fact that more intensification occurred in Vancouver and less in Calgary suggests either that the density of established areas is a poor indicator of the potential for infill and redevelopment, or that the availability of opportunities for intensification is not enough on its own to lead to their exploitation. American researchers have documented large amounts of discontiguous, "leapfrog" development at the urban fringe of many U.S. cities (Galster, 2001; Theobald, 2001). It seems, however, that the expansion of urban land in each of these three Canadian regions has occurred mostly within two kilometres of the edge of the existing urban area, maintaining a relatively contiguous growth pattern in each region. Thus none of the regions is characterized by leapfrog development. Turning to the distribution of growth within each region, we again find quite different development patterns. The submetropolitan area analysis showed that over one-quarter of all new housing constructed between 1991 and 2001 was located in Vancouver's Core Areas, compared with 15% in Toronto and 4% in Calgary. At the same time, virtually all of Calgary's housing growth -- 88% -- occurred in the Newer Suburbs, compared with 66% in Toronto and 59% in Vancouver. Not only do the overall intensification rates differ for the three regions, the location of intensification within the urbanized areas also differs. 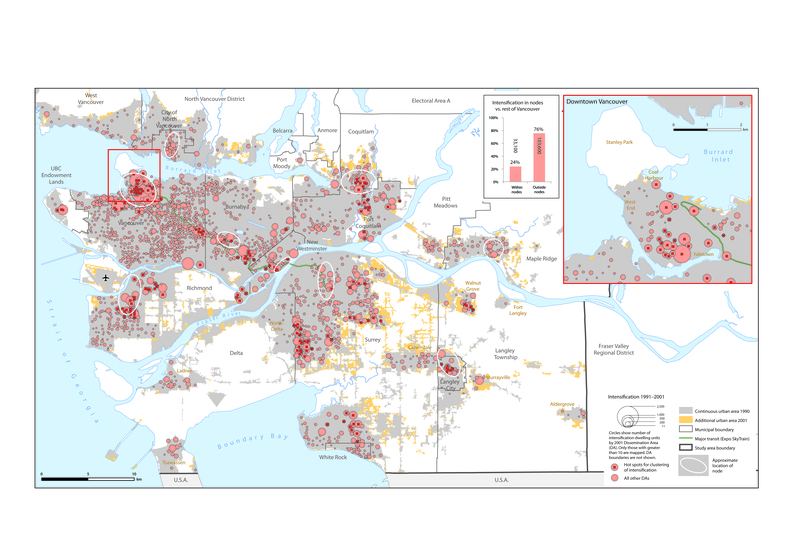 Maps and statistical analyses show that intensification occurs throughout the Vancouver region, especially in the City of Vancouver. Numerous concentrations occur along the Expo Skytrain line as well as in outlying municipalities. 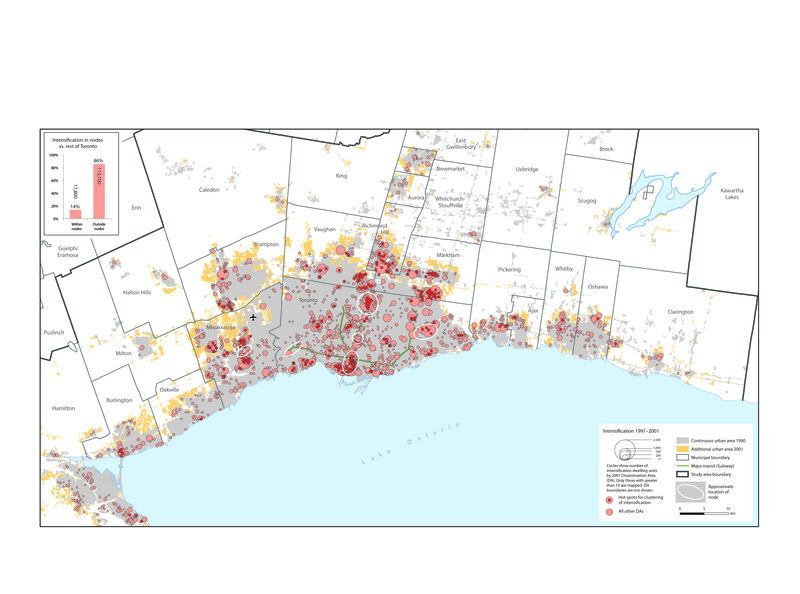 In the Toronto region, clusters of intensification occur in the City of Toronto and in neighbouring Mississauga, Vaughan, Richmond Hill, and Markham, however, there is little intensification in Hamilton and the Regional Municipalities of Durham and Halton. Calgary's small amount of intensification is widely scattered, with few concentrations. About 20% of all dwellings constructed between 1991 and 2001 in Vancouver was located in one of its eight designated "town centres" or in its metro core area. By contrast, only 6% of all new dwelling units in Toronto was located in the five established designated nodes or downtown Toronto, and less than 2% of Calgary's total dwelling unit growth was located in its downtown planning district. It may be that Vancouver has been more successful than Toronto or Calgary at directing growth to specific planning areas. While the findings in this chapter demonstrate that very different distributions of growth occurred in Toronto, Vancouver, and Calgary between 1991 and 2001, they cannot tell us why they differed. This question will be explored in Chapters 4 and 5. Table 3.16 summarizes the findings described in this chapter. 1. This category also includes "other single-attached houses," which Statistics Canada defines as "a single dwelling that is attached to another building and that does not fall into any of the other categories, such as a single dwelling attached to a non-residential structure (e.g., a store or a church) or occasionally to another residential structure (e.g., an apartment building)." These account for a very small portion of the total housing stock. 3. See Table C.2 in Appendix C for the complete table on which Table 3.6 is based. 4. While no comparable numbers are available for Calgary or Toronto, a study of residential intensification in Vancouver shows a similar rate for the same period -- 78% (GVRD 2007). In contrast to the satellite imagery-based approach used in this study, the GVRD report relied on "historic planning boundaries, property development records and land use density calculations" to derive urban land bases for the years 1981, 1991, and 2001. 5. On the causes and price effects of discontinuous urban fringe development see, for example, Peiser (1989). 6. Such DAs accounted for less than 9% of all dwellings built over the decade in each metropolitan region. 7. Unlike in the GVRD, the boundaries of the Toronto region's nodal planning districts do not readily correspond to census geography. With the exception of Mississauga City Centre, for which a more restrictive boundary was used, the district boundaries used in this study were defined for another Neptis Foundation report by Filion (2007). 8. Other nodes and suburban downtowns in the Toronto region could have been mapped and quantified. For example, Oshawa and Hamilton are both freestanding cities with their own central business districts. The mapping shows, however, that these were the sites of little intensification activity.